DVR WARS! Anthony brings this case against his good friend Joseph. Their issue arose when Anthony asked Joseph to record a reality TV cooking program for him. Joseph has an extensive cable TV package with digital video recording service, while Anthony has a much more basic set of channels and no DVR. Anthony has asked his friend to record multiple shows for him, but never consistently comes over to watch them. The shows sit on the DVR, taking up space and annoying Joseph. Is Anthony obligated to watch the shows after he's requested them? John Hodgman's final book of trivia and world knowledge, THAT IS ALL, is now available in bookstores (that are still around) and online retailers. To find out when he may be visiting a city near you, see Areas of My Expertise. "Please accept, as evidence, this email exchange upon my most recent request for my friend’s digital video recording services. I believe the irascibility of his tone serves to bolster my case." Do you get the cooking channel? I don’t. 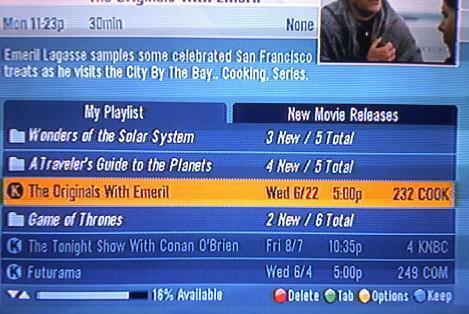 There is a show on there called The Originals with Emeril. My cousin is on the premier episode, “San Francisco”. If you get it, please record it for me so I can check it out. OK, but you always ask me to record shows that you never watch. "Why is the last show I recorded from June still on my DVR after 4 months? Because T told me he'll stop by and record it to his laptop!!! And he tells me this every 2 months. I've attached an image of my DVR recordings as proof that the show is still saved!!" And incidentally, I believe that Anthony (aka Bro-Schöde)'s understanding of favors is somewhat askew. If you ask a favor, the person you are asking has no actual obligation to grant the favor. If the askee tries to do you a favor and they are ultimate unable to complete the favor, the asker should accept that and move on. And if the asker has no need of the favor any longer, they should inform the askee lest they be inconvenienced. I would also hasten to add that I believe that "Hell's Kitchen" is available through cable and satellite "On Demand" services. It may also be available legally on the Internet through Fox.com or somesuch. I don't actually watch the program - I prefer Gordon Ramsay's "Kitchen Nightmares" and his other BBC programs - particularly his travels to India, which were fascinating television. But I believe I've seen the show in the "On Demand" listings on Comcast. It might have been advisable to check this before asking for a favor. So I would summarize the above as saying: I think Anthony is taking advantage of his friend a little too much. And finally - IANAL - but I think it would be a violation of copyright law to distribute copies of the "Emeril" episode to anyone. Yes, I know this is the Internet. No, I'm not perfect. And no, I don't necessarily agree with copyright law as it stands anyway. (That's another matter altogether.) But essentially admitting intent to violate copyright law to a judge - well, that's unwise. Anthony is fortunate that Judge Hodgman didn't bring his Hammer of Justice™ down upon his head any harder than he already did in his ruling. I liked Baliff Jesse's subtle reference to the non-Tolkien "Pippin". Filthy. For a man educated at Yale, it is phenomenal that he results to vulgarity and profanity in an attempt to be funny. Yes, I realize it was 'bleeped' out, but it was a feeble attempt and most certainly left little to the imagination. I may have to hear filth like this at a grocery store around my small town, but I don't have to subscribe to it. I love this show and I've listened since the start. I did not, however, appreciate the "buzz marketing" advert for "My Brother, My Brother and Me" that was wedged in-between the main case and the docket clearing section in Chambers. It seemed just cheap and non-MaxFun-y to do it, when everything is normally done so classy around these parts. I know that show exists, and I choose to not listen to it because it's not to my tastes. I didn't appreciate being reminded of it's sucky-ness mid-way through the show. I assume the need to try to market this lesser show during a better show is sign that fewer people are listening to it and I just wanted to point out that is likely due to the lower quality, rather than the lack of awareness. Apologies. I still love you. This podcast killed. I was on the floor. Hearing the kindly and even tempered Judge Hodgman release torrents of invective was a whole new level. I don't think one has to curse to be funny, either, but it worked brilliantly this time. I actually thought the funniest line was "this is an embarrassment", and the repeated use of the "yes?" taunt. I downloaded this episode through iTunes and it's only 12:47 there. I was listening in my car when it suddenly stopped playing. It looks like the whole episode is on the website. Anyone else have this problem? Hey there, a futzed-up file made its way into the feed for a few minutes, which is when you grabbed it. The correct file is up now in all locations, if you haven't already tried it. Thanks! What was with all the swearing? I can find crap like that anywhere. I couldn't even get through the podcast. I know a lot of people don't care about it, but I love your podcast when you have a decent question and rely on wit to be funny---which is unique to this podcast. To be truly funny without being offensive is harder (which is why there are so many explicit labels in the humor section) but much more funny when done well. So bummed. Thank you Judge John Hodgman for an timely and important lesson on bicycle safety. I quite often, contrary to the law in my city, wear headphones on my bike commute. I routinely argue with people that the impact on my safety is negligible at best. The argument is that I can't hear traffic noise around me which is not true. But another unseen menace lurked. During your several second long swearing tirade during this podcast, the mind splitting bleep sound that was injected directly into my brain cause the intense desire to ride into a tree. Lesson learned. So, did the show get deleted? Did Jesse find something to pound? WE MUST KNOW. One of the guys on this episode sound reaalllly familiar. Does one of them have a podcast/youtube channel? Note: I don't know these guys and this is not some lame attempt at buzz marketing! The fact that Judge Hodgman actually knew that Steve "Peregrin" Took was a member of T. Rex (one of my favorite bands ever) just goes on to prove that he pretty much knows everything there is worth knowing. THAT IS ALL.